It started with a number of tweets which Hamza Kashgari made on the occasion of the birthday of the Prophet – the Mawled. It was Saturday 4th of February. The tweets were emotionally charged conveying awe and love combined with pride and questioning. He was imagining an audience with the Prophet where Hamza would meet the Prophet as an equal, a peer, and a friend. Not a follower. Not an inferior or of a lesser status. He imagines him telling him that “I will not kiss your hands”. He imagines himself telling the Prophet that there are many things he loves about him as well as things he hates. And he says it all while imagining the Prophet accepting this form of behavior towards him, even encouraging it. Though also telling him that the people behind him will not accept it. That in this story it is the Prophet warning Hamza of his followers. By Sunday afternoon tweets had already reached the hundreds, all against him. In an almost unanimous voice they were all calling for his arrest, trial and execution. The tone was brutal and unforgiving. Hamza, realising the doors of hell that he had opened, tweeted a retraction and an apology. He also stated his repentance. But that wouldn’t help. People were insisting that he be executed even if he repented. Reading what he wrote one wouldn’t be surprised at the level of anger. Nevertheless, its extent and its demands are shocking. Last Sunday evening a well known extreme cleric, called Nasir al-Omar, held one his regular lessons and dedicated it to this issue in particular. The lessons are put on YouTube, and this one has gone beyond one million hits in three days. He was very theatrical in his performance, and started by weeping. He highlighted the security the country – Saudi Arabia – enjoys, and his fears that God will damn it and send His wrath upon it, and then pointed to the chaos across the Arab world. This implied that had it not been for the religious institution people would have been out in the street protesting as was happening in other Arab countries. Al-Omar then went on to mention the grave blasphemy that was committed in the land of the two Holy Mosques, and emphasised that this is merely one example of an apparently increasing phenomenon. He said that the right thing to do is to eradicate such thinking, purge the country of it, and to punish all those who had stated such things in the past. He summed up his main point by saying: we will only be satisfied when God’s ruling is set upon them. By God’s ruling he is pointing to execution. Execution is the punishment for apostasy in Saudi society, but it can be put off if the accused retracts and repents. But in the case of Hamza he cannot. Cursing or slandering the Prophet means death. Even if you repent. You still have to be killed. Naser al - Omar also called upon his audience and all Muslims who love the Prophet to send telegrams and faxes to the leaders of the country demanding that Hamza be punished. The next day Hamza left the country. He feared for his life from the individuals calling for his death. They were too serious for him to take lightly. At that point there was no government intervention. The campaign for Hamza’s arrest and execution has grown exponentially. Thousands of faxes and telegrams have been sent to the Royal Court and thousands of people have gone to courts to raise cases against him. And many more thousands on twitter we calling for his death. The situation was crazy and scary. Some went as far as to tweet his home address and details about his car. Surprisingly the demands for his execution were being expressed by people from all spectrums of society and colors of religiosity. In a heated debate one told another that if he saw Hamza walk in the street he would run him down. Some reformers also stood on the side of those calling for blood. The Minister of Information himself expressed extreme grief and anger at what Hamza wrote, banning him from writing in any Saudi publication. But one needs to note that the leaders of the campaign, coordinating and organising, were mostly, even exclusively, from the religious extreme. On Monday Hamza sent a letter in which he declared that he made a mistake in this specific instance and also in the past, and that he has been astray for a while but now he has seen his mistake and has gone back to Islam. Some thought that should close the matter, but most considered this irrelevant. Later on that day the King ordered that he be arrested and questioned by the attorney general for his actions. On Thursday he was taken in for questioning by the Malaysian authorities, and may be extradited back to Saudia Arabia to face trial. 1. The first emphasised the need to practise the morals of the Prophet himself in dealing with this situation. To apply his standards on his adversaries and other people who used to mistreat him or disrespect him. 2. A second emphasised his repentance, and that this should close the issue for good. They argued against the idea that retraction is not acceptable in this case. 3. 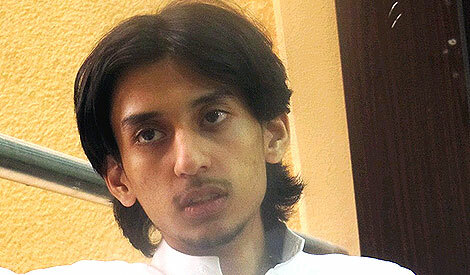 A third argued against the idea of executing apostates. These people were of course very small in number compared to those calling for blood, and had no impact in changing the course of events, but they did temper some of the wiser individuals who had simply followed the strong current. The matter continues to grow. And there are now growing demands to track down all those other freethinkers and heretics, and demand they repent or face execution. A few people starting expressing their worry as they received threats. Some of those threats came with screen shots of past tweets which contained statements that can be used to build a case of heresy against them. 1. The event itself – Hamza did provoke the emotions of Muslims in Saudi Arabia by what he said. Such language is not used with the Prophet here and people cannot tolerate that. 2. Social anger – The event cannot explain the amount of anger that spilled out. This is an indication of suppressed anger that is seeking a target, albeit a “legitimate” one. People want a victim, a sacrifice, one they can still feel good about. They want to kill, but legitimately. 3. Religious Institutions – They are the main organisers of the whole campaign, and they are using it as an opportunity to gain some ground after losing much. This is particularly after the change in the ‘religious police’, when the King fired the more conservative head of it, and assigned a more moderate one. Some of the more adamant reformers are now doubting whether they should be calling for more representation. They are asking themselves if it is the right step to give the people more power. They had always been critical of those who claimed that the Saudi people are not ready. And they always counter argued that much of the negativity we witness is due to lack of representation. But now they also say that the people seem to be their greatest enemy. That if they are given more power, with this low level of social and political awareness, with this extreme degree of intolerance, with this insistence on the blood of a young man, the only outcome would be bad. And the fact is that today the only organised groups in the country are the more extreme ones. The one’s with the mobilising capacity are the radicals. The moderate voices are bound to lose in any game of representation. Yesterday the Council of Scholars issued a statement which effectively insisted that any criticism of the Prophet no matter how minor is considered to be on the same level as cursing him, thus deserving the same type of punishment, which is death, and without the opportunity of retraction or repentance. Some media outlets were framing him in terms of being rude to the Prophet, rather than in terms of him cursing the Prophet. Some observers saw some hope in that, as that difference could have saved his life, as being rude to the Prophet merely makes you an apostate who can repent and be set free. It was thought that the framing was deliberate and coordinated. Someone wanted to save the young man’s life, but then the Council of Scholars ended the debate. A real solution is to review the principle of executing apostates. But that’s a solution no one wants to even consider now. And to make matters worse a Saudi newspaper translated parts of an interview Hamza did with the Dailybeast. In the translation Hamza appeared arrogant and refused to admit his mistake. The overall tone just made matters worse. Reading the English version will give you a different impression. It is doubtful that the matter will reach the point of execution. But a severe punishment is inevitable, that is unless the King steps in and decrees that Hamza’s repentance is enough. What will happen remains to be seen.